It was our final day in NYC and the only thing standing between us and Penn Station was brunch with some friends from home who also happened to be in the city for the weekend. 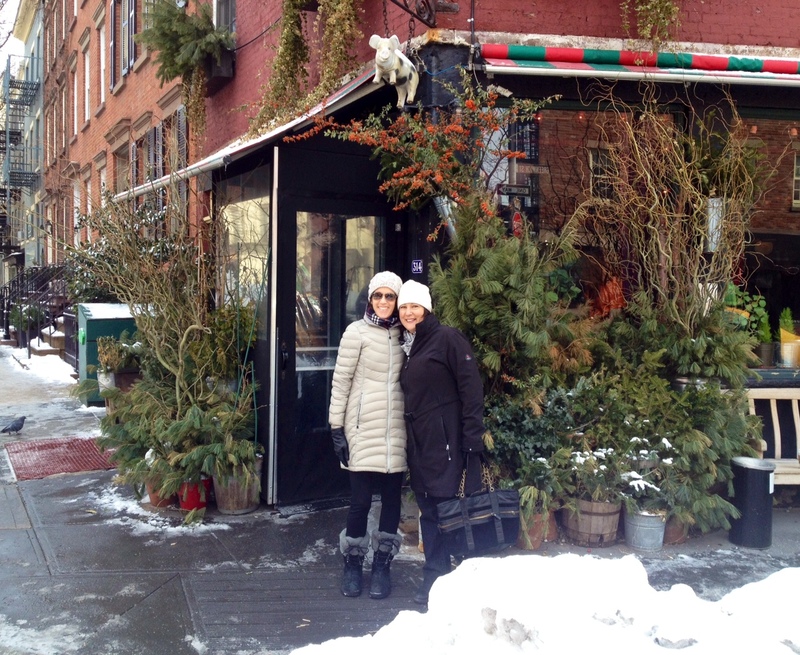 We met at The Spotted Pig in the West Village which I had read about online and looked like a really fun place to try (ironic that two of our restaurant selections had the word pig in the title). Opened in 2004 by April Bloomfield and Ken Friedman, The Spotted Pig was the city’s first gastropub. It serves “seasonal British and Italian dishes using local ingredients when possible”. I read somewhere online that Jay-Z and Mario Batali have a piece of the ownership too, although the restaurant’s website coyly says they co-own with “some pals”. Nice pals! April’s culinary mentors include Ruth Rogers and Rose Gray of The River Cafe in London, which I have visited and highly recommend. The Spotted Pig does not take reservations so we planned to get there early anticipating a line. The good news was it was freezing outside, so no line! The bad news was it was freezing outside and we were waiting for maybe half-hour, but it was worth it. The line quickly filled in and by the time the restaurant opened, I am pretty sure its 100 seats were filled. The Spotted Pig is an intimate restaurant, decorated whimsically with barely a wall unadorned with a plate, print, pig or plant. There is a bar on the first floor and a smaller bar upstairs. The seats are primarily stools and the whole place almost feels very Alice in Wonderland-like. The staff is young and friendly. My friend Ann is a big foodie and I was excited to have her be my co-Scout for the meal! Here is a picture of us in front of the restaurant. I used to work with her husband, but she and I became fast friends having our first babies within days of each other. And she’s 100% Greek so we’re practically related. 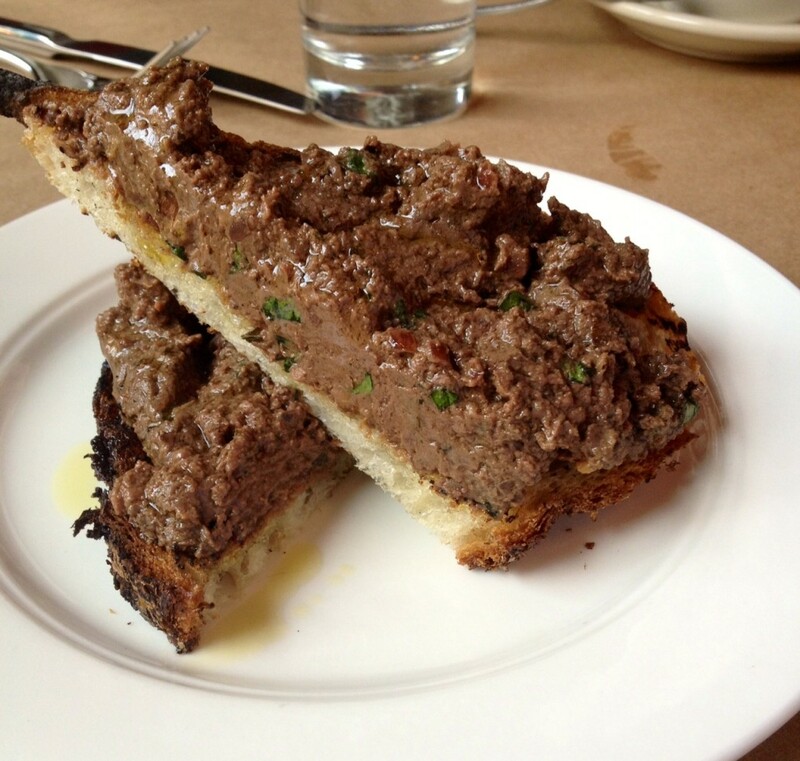 We started our meal by sharing an order of Chicken Liver Toast. Admittedly, it wasn’t the most pleasant thing to look at, but it was delicious. Ann chose to have the Dutch Baby. Our waiter described the dish “as if a pancake and a crepe had a baby”. Interesting description. 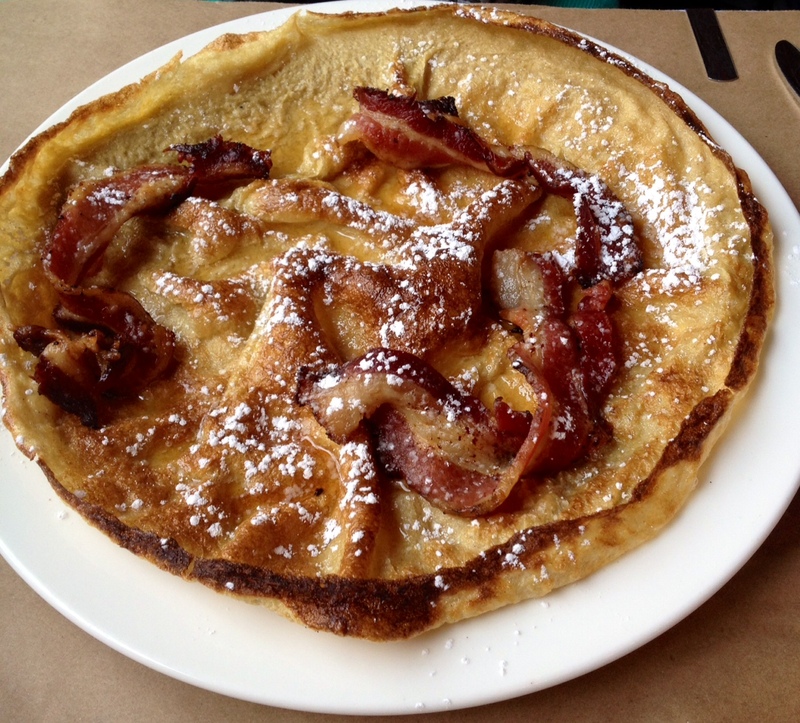 Served with bacon, maple syrup and powdered sugar, it was a perfect breakfast dish. 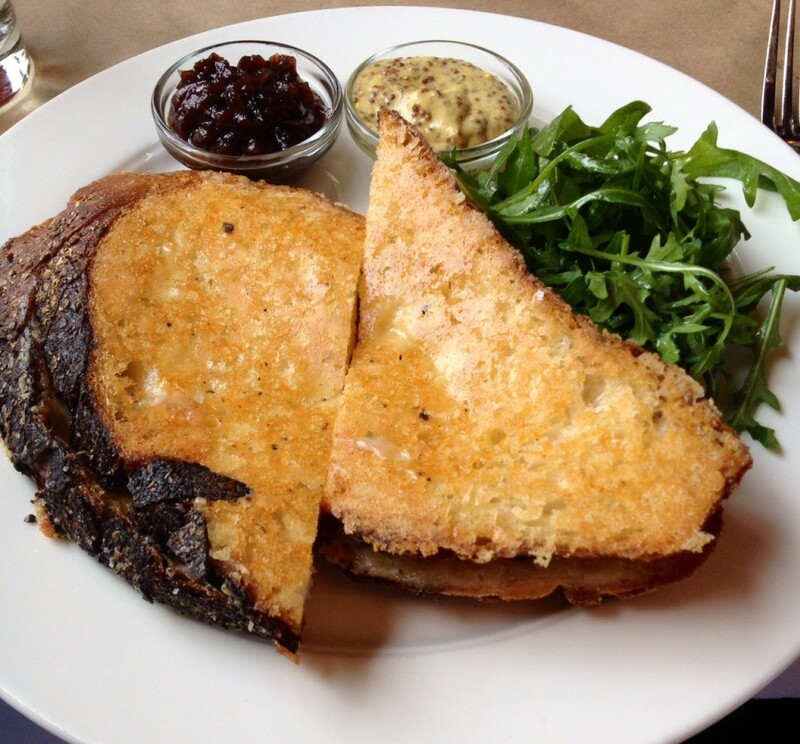 I was more in a lunch mood, so I ordered the Grilled Cheese sandwich with Onion Marmalade and Mustard. This is not your typical grilled cheese. It is basically a croque monsieur on steroids and minus the ham. The inside is a creamy mixture of taleggio, fontina and goat cheeses (all awesome melting cheeses). The outside is a mixture of butter and parmesan. The marmalade and mustard help balance the richness of the sandwich. My husband chose the scrambled eggs and Ann’s husband ordered the french toast with bananas and bourbon syrup. We were all more than satisfied! 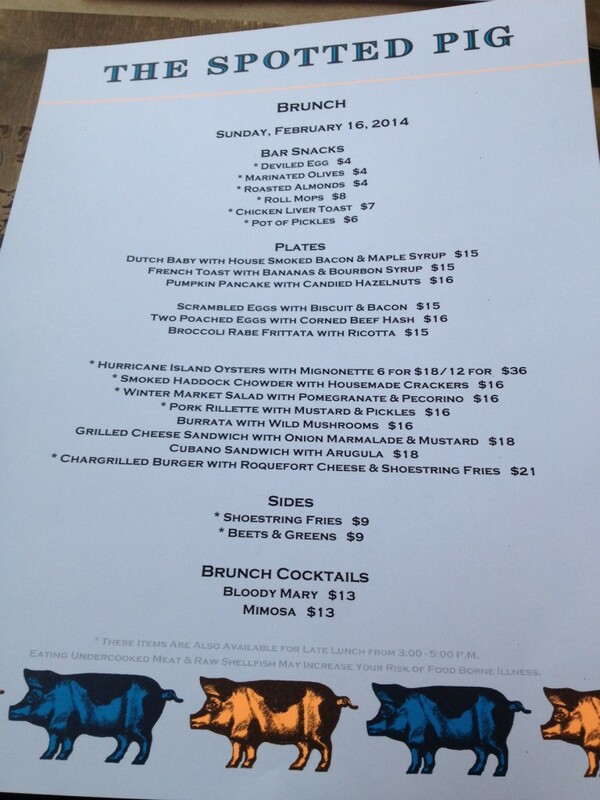 Check out The Spotted Pig sometime for lunch, dinner, cocktails or brunch! Ann and Dan had another night ahead of them in the city, but my husband and I were headed to Penn Station with our memories and our Proscuitto di Parma for the train ride home. Can’t wait to go back to NYC sometime soon!